How do you choose 3 recipes amongst 300+ all-star recipes that were dished out as part of the international blogging Marathon that concluded recently ? It was indeed a tough task, but based on my personal favourites and family preferences, tried out 3 dishes (and more!) for this week's theme of Bookmarked recipes. 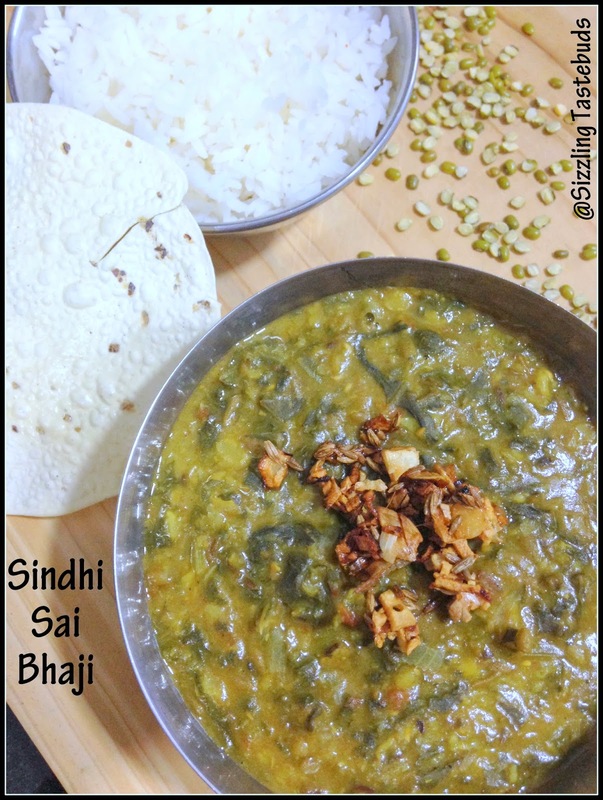 The first today is Sindhi Sai Bhaji (from Pakistan, actually) bookmarked from PJ's blog. She had about 80+ salad and soup combos too - but I had done enough justice to both salads and soups in my own blog, so this curry caught my eye as soon as I saw it. Thank you PJ (and Vaishali), for a wonderful recipe - contrary to what I thought, we loved the garlicky taste and aroma of the curry. Although I didnt follow it to the T (mashed brinjals is not on my fav list :D), we enjoyed it with steamed rice for a lovely dinner (that explains the low light in the pics :-)). 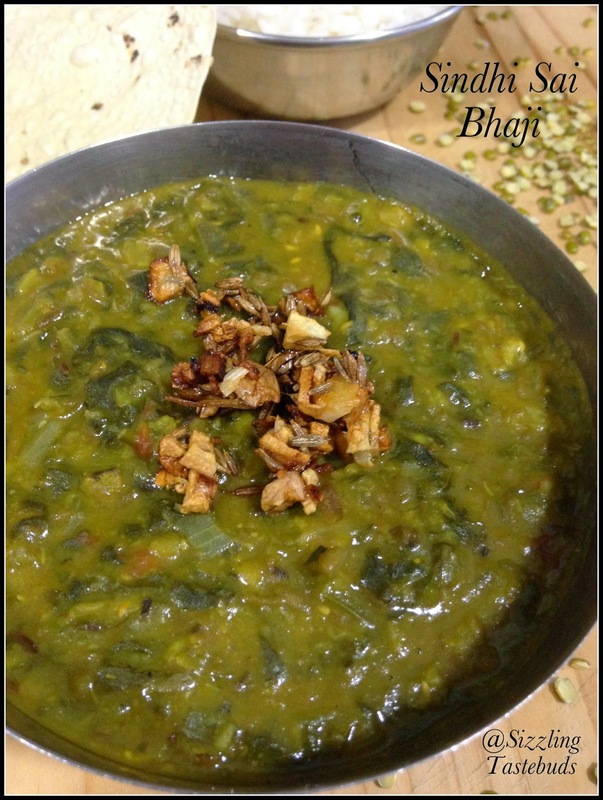 Soak the dals for ½ hour in warm water. Pressure cook the dals, vegetables, greens with salt and half of the masala powders – let it cook for 2-3 whistles. Once done, add 1 cup of water and mix well. In a pan, sauté chopped onions, garlic pods, tomatoes, half the minced garlic till onions turn slightly brown. Add the cooked stuff from the pressure cooker - Let it simmer, add the rest of the spices and check for salt. 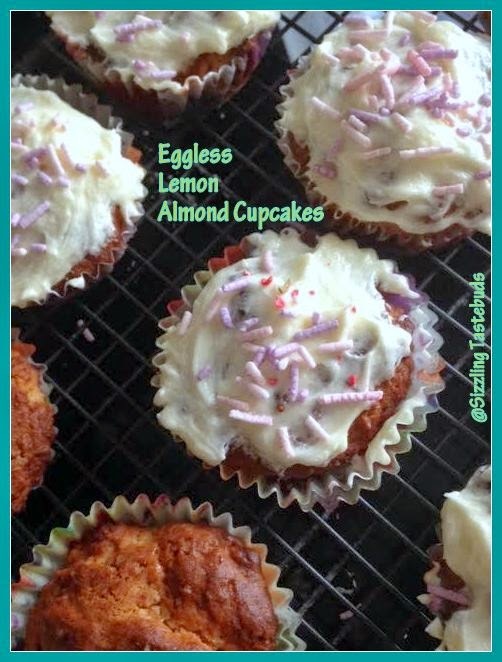 After a series of savoury lemony dishes, its time for Lemony cupcakes. And to be honest, I have never been fond of citrusy bakes.... till I found this awesome combo of almonds and lemon (why almonds - thats a different story).. But till then, me and my family loved this citrusy cupcake with a hint of almond... with or without glaze, this works perfectly well for hi-tea or even as a pick-me-up after a light dinner. I used brown sugar as I am fond of it, you can use jaggery or even normal crystalised sugar. 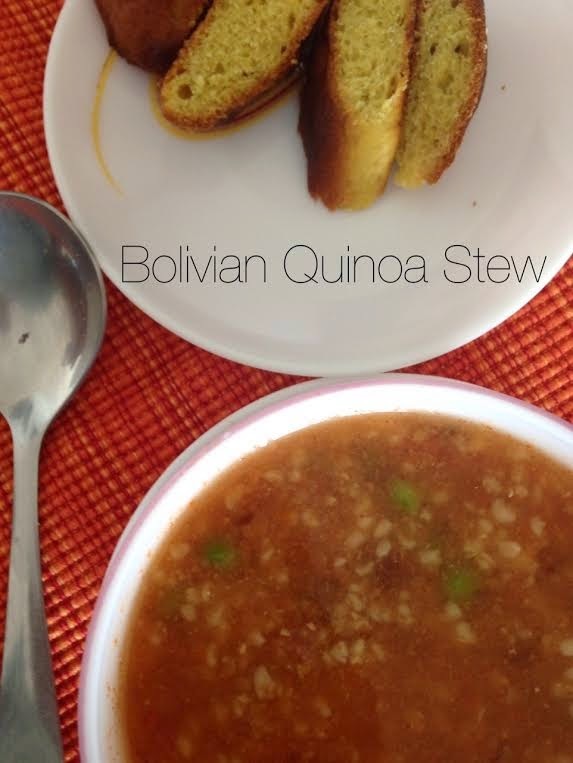 I took inspiration from this recipe and made some changes, which turned out very good. You can also make it vegan by replacing the milk and yoghurt with vegan options. Its a very forgiving recipe and you can easily double or triple the quantities. This recipe made 10-12 medium sized cupcakes. As it was for my kiddo (who loves lemons), I frosted half the cupcakes that I was serving the kiddo. Rest of the cupcakes were equally good even without the frosting. Sending this to BM 46 under Lemon Dishes. 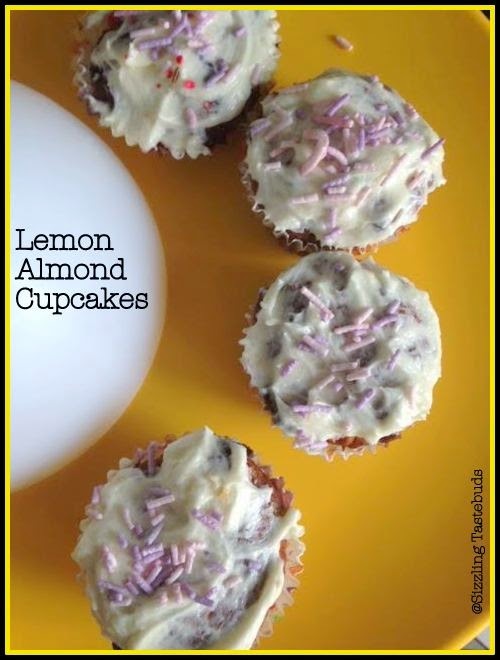 Hope you enjoyed the series with Lemon Sevai, Lemony Broccoli stir fry and today's dish - Eggless Lemon-Almond Cupcakes. Will be back with a different theme next week. Sieve the flours, soda and baking powder in a large bowl. Now add lemon zest, vanilla essence yoghurt and brown sugar and stir well till the sugar dissolves. Add wet to dry ingredients and slowly blend in the almond meal. Beat butter and sugar till creamy. Add the lemon juice and zest as much as you need it to be tangy. Cool the cupcakes thoroughly and then spread the frosting. If you are piping over then you need to double the frosting. Mine was a very light glaze as I cut down the butter. 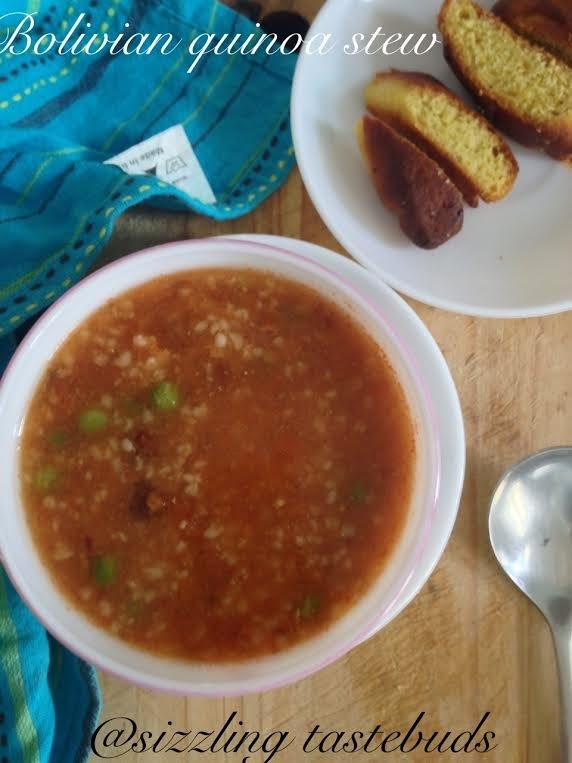 For day 2 of lemon based dishes, I made something that we always liked but never got around clicking the dish. 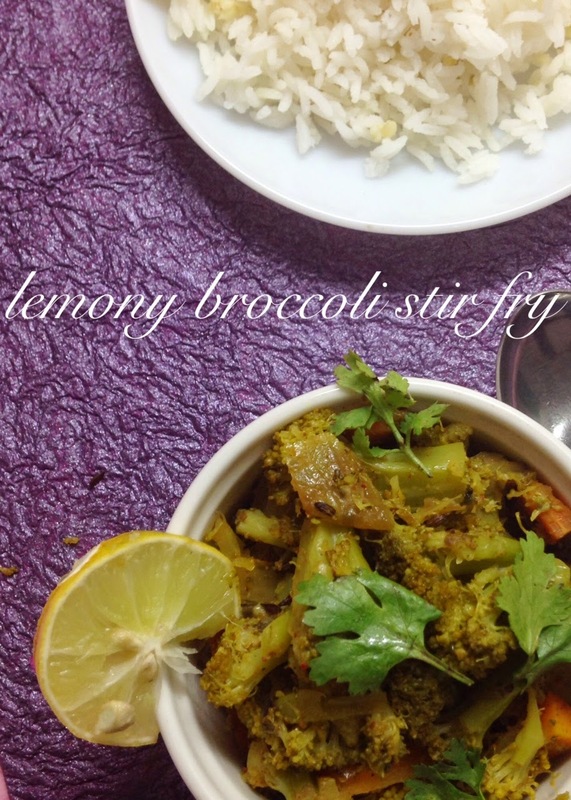 This lemony broccoli stir fry is our family favourite and it's something that sure to perk up your day. I usually make lemon rasam, lemon pickle , lemon Sevai using Lemons. Today's stir fry is an universal cuisine - you could eat it as a salad or team it up with ridge gourd dal and rice like we did for today's dinner. Simple to make and yummy to taste. For those of my readers who are fond of subtle lemony dishes, this is a winner. In a pan, heat oil. Sauté onions, splutter cumin and fry till onions turn slightly brown. Switch off stove and finish wit lemon juice. Sending this to BM # 46 under "cooking with lemons" theme. In a pan, heat oil. Temper with tempering ingredients, add peanuts and cashewnuts and fry till golden brown (about 2 mins). Add onions and veggies and saute till onions turn golden brown and bell pepper is crunchy. Now add the cooked sevai and toss lightly taking take not to break the strings. Switch off flame. Tip in lemon juice, coriander leaves, fresh coconut.